You may have never heard of it, but your psoas muscle plays an essential role in determining the health of your spine. Muscles like the psoas are essential to helping us maintain a healthy spine position and healthy posture. There are 3 significant muscles that connect your spine to your legs. These are the gluteus maximus, piriformis, and psoas muscles. The psoas muscle attaches to the vertebrae on your lumbar spine, crosses the outer edge of each pubis bone, then joins with the iliacus muscle in your groin region, and finally attaches at your femur. 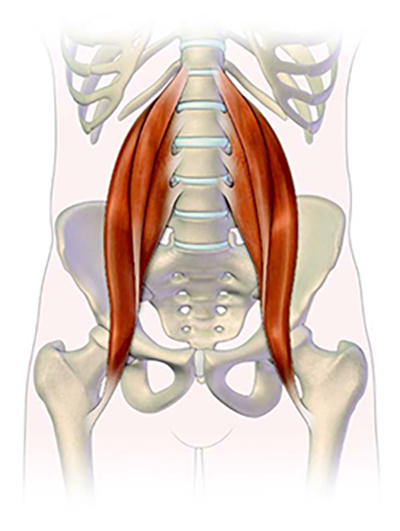 Together these muscles are known as the iliopsoas. You can stand and walk upright in part because the curve of your lower spine bears and transfers the weight above it. The psoas muscle helps to create this curve, as it pulling your lumbar vertebrae forward and down. The psoas muscle also plays another essential role in helping you walk. When you are walking, your brain triggers your psoas muscle to move your back leg forward initiating the alternation between the front and back leg. How does the psoas muscle cause back pain? When you sit for extended periods of time, your psoas muscle may become tight. This in turn, can pull your pelvis forward which places pressure on your lumbar spinal discs. This additional pressure often results in lower back pain. If you arch your back when squatting to lift a heavy weight, such as performing a dead lift, your pelvis rotates forward. This again increases pressure on your back. However you are adding the weight of the load to your body weight, and raising the pressure on your lumbar discs even higher. Drop your left knee down beneath you, with your left leg extending away from your body and your toes touching the ground. Place your right leg in front of you (with your foot flat on the ground), so that your right leg forms about a 90-degree angle. Squeezing your left buttock, gently push your pelvis forward. At the same time hold your abdominal muscles tight. While doing this, maintain good posture with your shoulders tall and head upright. You should maintain the 90-degree angle at both knees. Hold this position for 20 to 30 seconds, and then repeat on the opposite leg. If you suspect your psoas muscle is the cause of your lower back pain, book an appointment with us. We can provide a proper diagnosis, some hands-on treatment and a personalised program to speed up your recovery.